Plot Summary: Professor Daidouji has developed a gravity machine called the GX Device. Unfortunately, the Shocker Organization wants it; so they attack the professor and destroy his laboratory, but come home empty-handed. Shocker's agents find out that the plans for the GX Device are with Daidouji's daughter, who is celebrating her birthday. 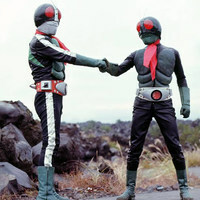 Now the Kamen Riders, along with FBI agent Kazuya Taki, must protect Daidouji's daughter and prevent Shocker from obtaining the plans.